MSFT’s strength in AI is a considerable weapon as it pursues its 3-part strategy, working from the cloud out and pointing the company toward becoming the dominant force in driving enterprise productivity. 1. Reinvent productivity and business processes – With applications on its cloud, MSFT can use AI to analyze workflows on behalf of customers, identifying high performing teams, best practices, and obstacles to efficiency across their organizations and business ecosystems. We believe that this has huge potential. 2. Build the intelligent cloud platform – AWS leads Azure by a wide margin today, but MSFT is gaining as traditional enterprises look to the cloud. Azure has sufficient scale, but can differentiate with tools to support hybrid applications, data management, and analytics – including AI. 3. Create more personal computing – MSFT plans an AI centered user interface paradigm that can transcend device platforms, including its own Windows, engaging users from the cloud through applications that can work anywhere. We believe MSFT’s current platform dominance in the workplace and SaaS/IaaS/AI leadership gives it an enormous leg up in establishing this new UI approach. These 3 elements – well-integrated suites of smart applications using usage data and AI to guide decision making, a leading hyperscale computing platform with powerful tools to help enterprises transition to the cloud and exploit its myriad benefits, and an intuitive, smart and “frictionless” interface that follows users across platforms – will combine to allow MSFT to target a much, much larger share of enterprise IT spending in the future. Nadella’s 3-part strategy. After becoming MSFT CEO in 2014, Satya Nadella issued a new mission – “To empower every person and every organization on the planet to achieve more.” 3 challenges – 1. Reinvent productivity and business processes, 2. Build the intelligent cloud platform; and 3. Create more personal computing – are the reporting structure as well as the planks of the strategy. We believe that these vague tenets, backed by leadership in both cloud hosting and AI (http://www.ssrllc.com/publication/a-deep-learning-primer-the-reality-may-exceed-the-hype/), underlie an audacious play for the next era of enterprise computing that could dramatically expand MSFT’s dominance. Leveraging unique assets. MSFT starts with a powerful hand – 1.6B Windows users, 1.2B Office users, a world-class hyper-scale data center infrastructure, long experience and deep expertise in AI technology, and a crack salesforce with relationships with almost every IT organization on Earth. We believe that Nadella’s strategy could use these assets to revolutionize the way that enterprises and their employees work and use information. In this context, the 3 strategic planks take on more meaning. Using data to drive productivity. MSFT’s successful transition to the SaaS model for its massive Office franchise, along with the growth of Dynamics, LinkedIn, and other SaaS products, is delivering clear cost and performance advantages to its customers. Longer term, this shift has even larger implications, as the data available by hosting all of this activity on MSFT’s cloud feeding state-of-the-art deep learning systems can yield extraordinary insights for enterprises. Managements will be able to assess organization dynamics – workflows, team and individual performance, sales effectiveness, business process best practices, etc. – with unprecedented clarity, giving MSFT a unique position vs. all rivals in enterprise application software. Gaining cloud platform advantage. Cloud hosting is attacking the nearly $1.4T spent annually by enterprises worldwide on their data center operations. At the core are IaaS platforms levering scale and architectural advantages to offer computing and storage capacity with clear performance advantages at a fraction of the cost of private facilities. We believe that MSFT’s Azure is one of only 3 platforms (AMZN, GOOGL) with the scale and capability needed to assure long term success. MSFT’s tight positioning with IT organizations and its emphasis on the needs of traditional enterprises, along with a growing suite of services primed to facilitate migration to the cloud, to support hybrid operations, and to enhance customized development, including AI tools, are and will be key differentiators in an obviously price competitive business. Changing the interface paradigm. “More personal computing” is the glibbest of the 3 strategic tenets. For the moment, MSFT’s platforms and devices – Windows, Surface, phones, Xbox, etc. – are reported under the banner, but for the longer term, we believe Nadella has greater ambitions. An AI interface that reaches to any platform bringing coordinated secure access to MSFT’s applications, an enterprise’s own systems, and cloud-based resources could obviate the need for OS control. The interface, perhaps a future version of Cortana, would be an intuitive and personalized tool for accessing needed information and executing tasks, taking input from users in many forms – text, clicks, taps, speech, gestures, eye movement, etc. – and considering context – time, place, other people, schedules, etc. – to respond in the most effective manner, thus driving adoption and usage for MSFT services. Advantaged for $1.5T+ addressable market. 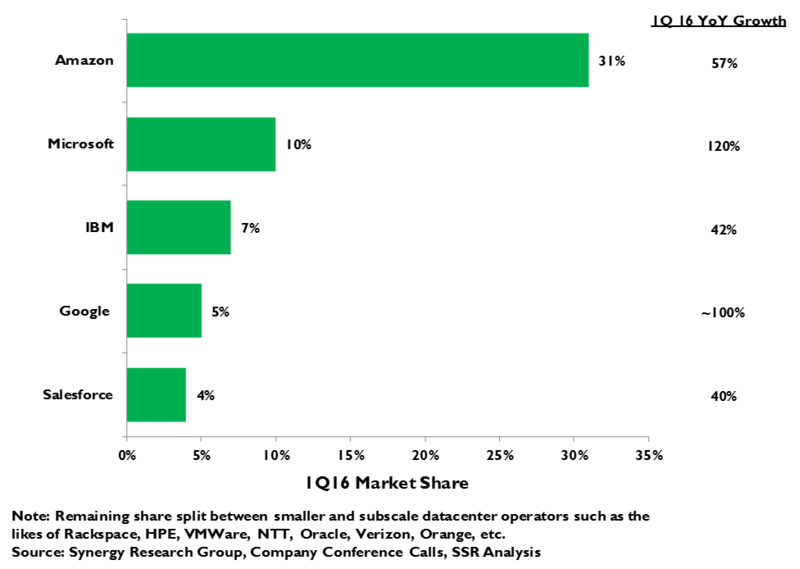 The productivity/business processes thrust addresses the $330 B application software market. By creating data and interface synergy across applications, MSFT can build traction for its Dynamics ERP, LinkedIn, and BI, and longer term, create unique organizational productivity products that have no analog today. 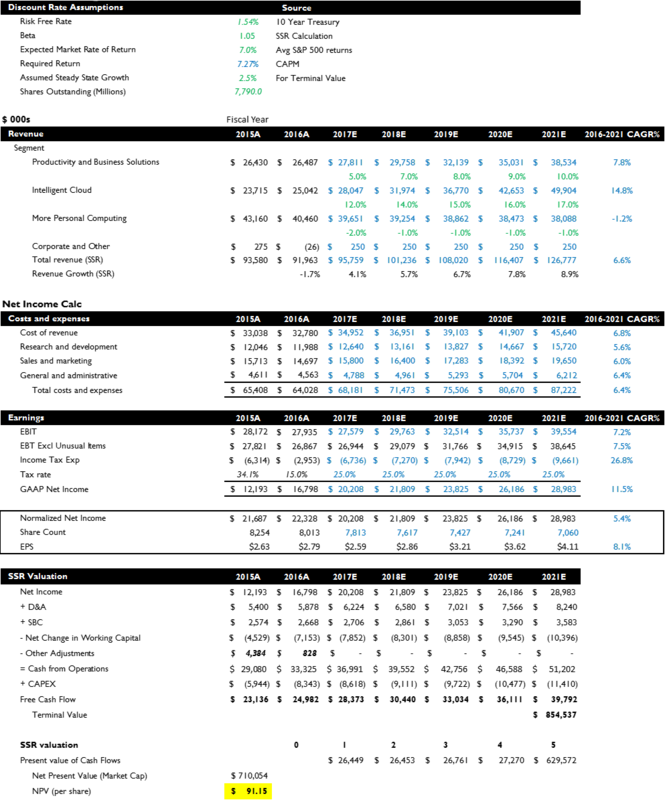 None of its main rivals – ORCL, SAP, CRM, etc. – can counter its cloud infrastructure or AI development capabilities. The competitors for the $1T+ IaaS hosting opportunity, specifically AMZN and GOOGL, may lead MSFT on a cost basis but cannot really leverage existing enterprise relationships. We also see MSFT as better understanding of the real needs of traditional IT shops as they face transition to the cloud. Finally, the market opportunity from UI paradigm change is more difficult to quantify and has obvious rivals in GOOGL, AAPL, and even AMZN. Still, in the enterprise context, we believe Cortana helps to differentiate MSFT applications, build switching barriers, and could be a bridge to the consumer market. Expecting acceleration. MSFT’s strategic products – Office 365, Azure, Dynamics, etc. – are driving growth while the slow erosion of the Windows platform creates drag. Still, previous concerns that iOS and Android tablets would displace workplace PCs now appear significantly over blown. We believe that Nadella’s strategic investment will spawn new products – a broader suite of SaaS applications, new platform tools, etc. – that will supplement the existing growth products. We believe that the consensus 8.5% 5yr EPS CAGR can be easily beat as the strategic businesses drive sales acceleration and cost cutting initiatives boost margins. With time, the investment narrative will change to encompass Nadella’s strategic vision and expectations will be revised upward, yielding 40-50% upside to current valuations. The first decade or so of MSFT’s existence was all about finesse, dancing amongst IT giants to establish Windows and Office as standards. The ‘90’s were pure swagger, extending Windows into the data center and using it to control how people used their computers. The antitrust consent decree near the end of the millennium yielded a chastened MSFT that rode global expansion and upgrade cycles, but failed to gain traction on new businesses. Satya Nadella’s rise to the CEO office marked the start of a fourth strategic era for the company, one that we believe that positions the company to re-establish its enterprise dominance. Despite moribund performance over the prior decade or so, Nadella took the reins of a company with enviable assets. It has a stellar sales operation well positioned with most of the world’s IT professionals. It has a world class hyperscale data center infrastructure born of its investments to compete in search. It has AI talent and experience second only to GOOGL. And it has a dominant franchise in productivity software that has already begun a successful transition to the cloud. The new MSFT mission statement – “To empower every person and every organization on the planet to achieve more.” – puts productivity front and center. The first of 3 strategic planks is more explicit: “Reinvent productivity and business processes” imagines more than a simple transition to the SaaS model. With applications running in the Azure cloud and generating oceans of usage data, MSFT’s deep learning will help it derive unique insight into how organizations might be able to improve the way that they work. This is new and extraordinarily valuable ground that only Microsoft can cover. The second plank is straightforward: “Build the intelligent cloud platform”. Modern hyperscale data center platforms have enormous cost and performance advantages over the private enterprise operations, prompting a slow but inexorable exodus to the cloud. The cloud platform game rewards huge economies of scale and experience, which have separated a trio of likely winners – AMZN, MSFT, and GOOGL – from the pretenders. While the basic IaaS product may be generic computing and storage, MSFT will exploit its enterprise savvy, ubiquitous relationships, powerful franchises, and world-class development capabilities (including AI) to differentiate its services with higher layer tools and applications. This could be a $100B annual business in the long term. The third plank is conceptual. We believe “More personal computing” points to a different interface paradigm across platforms and applications, one that not only personalizes the user experience by anticipating needs and maintaining easy continuity across devices, but also removing friction that keeps people from finding and doing what need from their platforms and applications when they need to do it. We recently wrote about AI virtual assistants (LINK), and MSFT is positioning Cortana not just as a Siri wannabe, but as a comprehensive access portal for MSFT services in the enterprise as well. We believe this is an enormous opportunity. MSFT’s Windows business may be in a long, slow decline, but the cloud products behind this strategy have already turned the company to growth. As the 3 planks become the larger piece of the company, we expect acceleration in sales and leverage to the bottom line. We believe the 5-yr consensus expectations for 8% annual EPS growth seriously understate the potential trajectory for MSFT and its potential to dominate the next era of enterprise computing. In the first fifteen years of Microsoft, Bill Gates won the trust of IBM, developing PC-DOS for the company and signing on to co-develop OS/2, Big Blue’s planned next generation platform. Simultaneously, Gates delivered Word and Excel for the fledgling Mac platform, ingratiating himself with Apple founder Steve Jobs and avoiding direct confrontation with the growing PC developer community. Microsoft had also taken a 25% stake in The Santa Cruz Operation, whose SCO UNIX was the leading implementation of that open source OS. All the while, Gates had the company working on Windows, the platform that would borrow liberally from the Apple cannon – most of which had been borrowed in turn from Xerox’s PARC research labs – and compete directly with IBM’s OS/2. This audacious strategy, made complete when Microsoft ported its popular Office productivity suite over to Windows in 1989, catapulted the company into dominance (Exhibit 1). 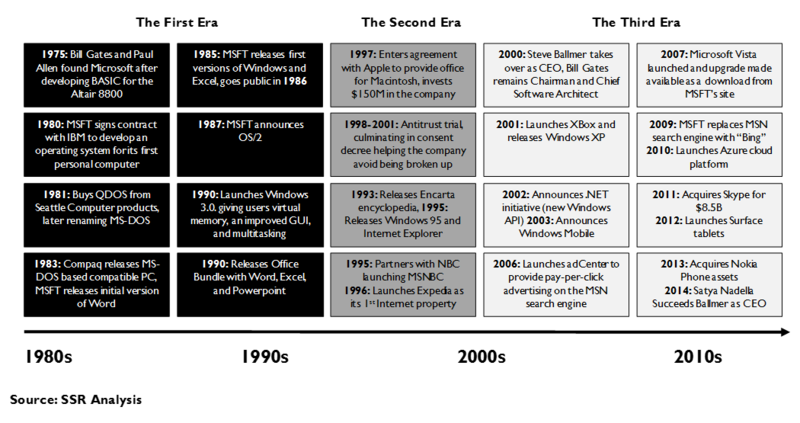 The second era of Microsoft, spanning the 1990’s, was a happy one for investors. Windows was the undisputed champion of the desktop and Office was the primary productivity suite in a decade where the proliferation of PCs was the prime driver of the tech world. Microsoft was able to lever its desktop dominance into the data center, as clustered x-86 servers supporting the PC clients began to displace the mainframes and minicomputers that had established the previous enterprise computing paradigm. The burgeoning population of PCs spurred networking and networking spurred the internet. Microsoft launched Internet Explorer, and began to bundle it into Windows, effectively crowding out other browsers, like Netscape Navigator, which had sprung up before it. This was the last straw for the US DoJ, which stormed in to break up the party. In 2001, Microsoft avoided being broken in two by signing a consent decree that significantly curtailed its ability to bundle its products together and opened its platform more freely to 3rd party developers. In the aftermath, under new CEO Steve Ballmer, the company struggled to find its mojo. The global PC installed base was still expanding and the company largely hit its marks for upgrades to its Windows and Office franchises, but it failed to deliver the next big thing for which its investors clamored. Mobile and internet were viewed as big whiffs, and the stock slogged forward in growth purgatory for more than a decade despite consistently strong annual cash flows. The sluggishness was all the more glaring when old friend and nemesis Steve Jobs dropped the iPhone on an unsuspecting world and began a smartphone revolution with Microsoft sitting on the sidelines. Finally, as PC growth sputtered and rolled into decline, analysts began declaring the company down for the count. Enter Satya Nadella. Contrary to popular opinion, Microsoft’s investments in the Ballmer era were not fruitless. Bing, characterized by many observers as a money pit as it scuffled in pursuit of Google Search, required big investment in the scalable, high performance data centers and big data analytics that became Azure (Exhibit 2). That infrastructure allowed Ballmer’s Microsoft to be the first amongst the major enterprise packaged application players to move resolutely to the SaaS model. Along with Xbox, Skype and other maligned businesses, Bing also prompted Microsoft to invest in top deep learning talent, long before most of the rest of the industry thought it was cool. 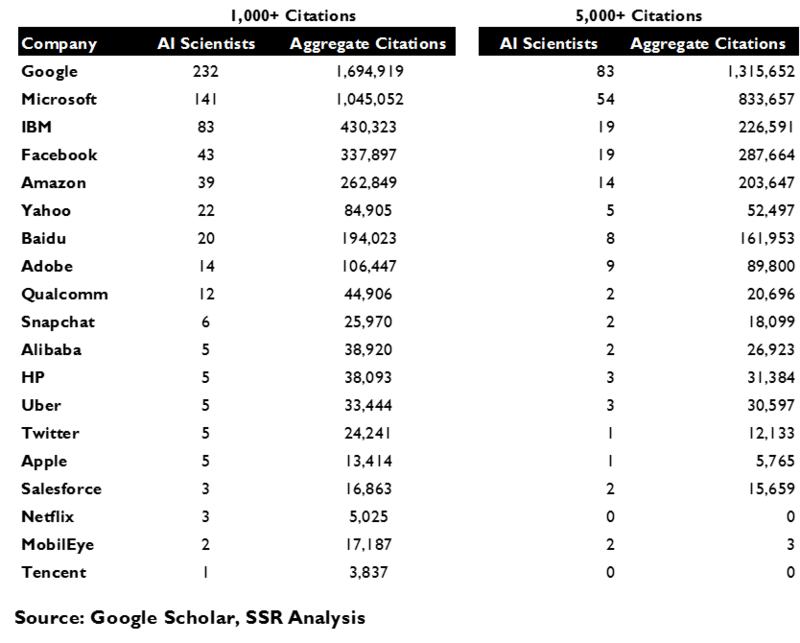 It has more scientists with 1,000+ citations in AI publications than any company other than Google, far ahead of IBM, its closest rival amongst enterprise IT companies (Exhibit 3). That brainpower has contributed mightily to Microsoft’s leadership in natural language processing, gesture controls and augmented reality. Obviously, Microsoft also has key assets borne of some 25 years at the top of the enterprise IT food chain. It has a huge, talented sales operation positioned with nearly every IT professional in the world. It has 1.6B Windows users worldwide and 1.2B relying on Office. On the basis of account penetration, Microsoft’s SQL server is likely the number one database program in the world, although much higher priced Oracle and IBM both top it for revenues. 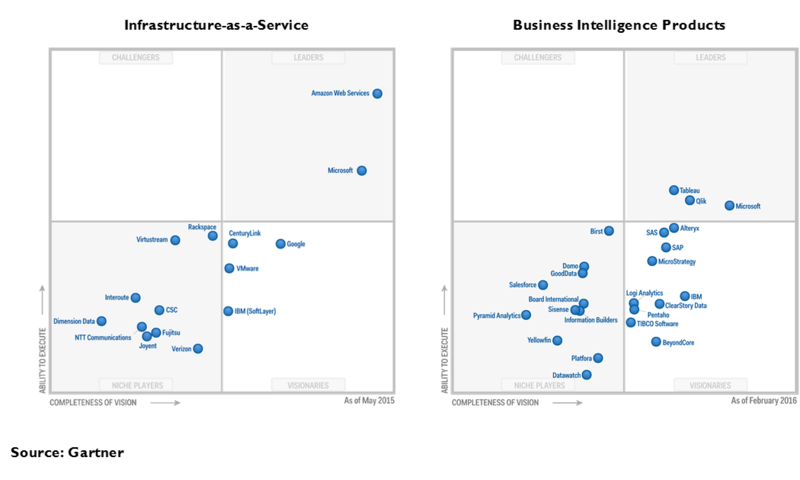 Gartner rates Microsoft’s business intelligence products, led by Power BI, as leaders in the fast growing field based on the company’s vision and execution (Exhibit 4). The recently acquired LinkedIn has a unique data set with employment histories for hundreds of millions of professionals feeding a fast growing HR SaaS software suite. These are assets to build upon. CEO Satya Nadella intends to build. Shortly after rising to the CEO office in 2014, Nadella issued a new mission statement and laid out the bones of his strategy (Exhibit 5). While Google’s mission focuses on “organizing information” and Facebook’s focuses on “empowering people to share”, Nadella focused on driving productivity, with a mission to “To empower every person and every organization on the planet to achieve more.” To that end, he outlined a strategy with three objectives: 1. Reinvent productivity and business processes, 2. Build the intelligent cloud platform; and 3. Create more personal computing. 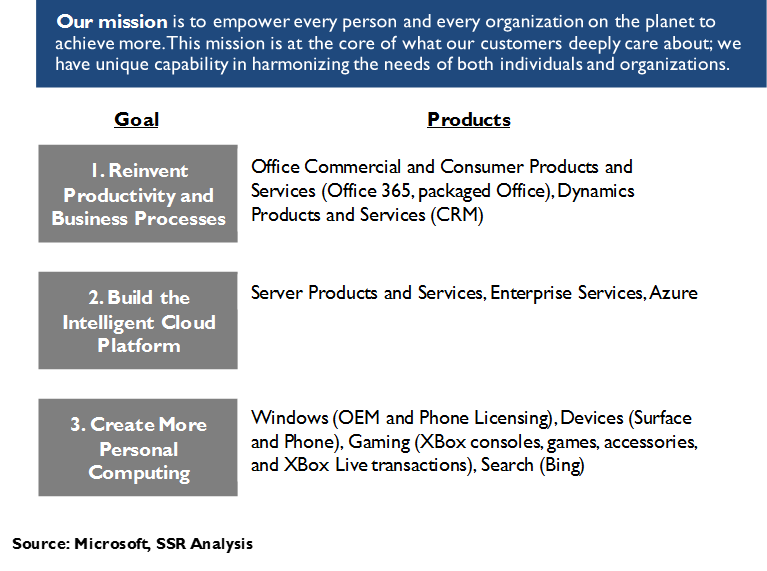 Structure followed strategy, and these three business goals are the basis for Microsoft’s reporting segments as well. Of course, every company has a facile mission statement and a punchy PowerPoint on its clever strategy, but we believe that Nadella’s marks an important shift for Microsoft, and perhaps, the beginning of a new era of greatness for the company. The migration of over a billion Office users to the Office 365 SaaS platform is just the start for Microsoft’s most important business unit. Once users are working on its cloud, the company will be able to analyze the way they use the product and with whom they work to the specific benefit of its enterprise customers. 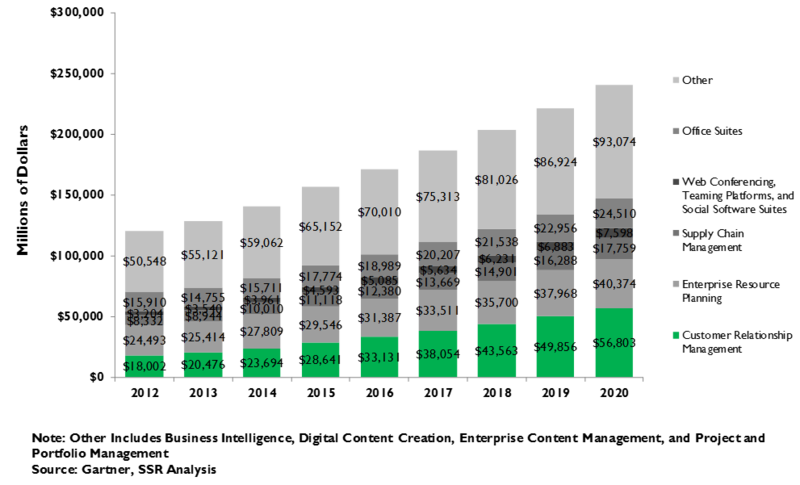 Mountains of data from the daily use of Word, Excel, Outlook, PowerPoint, Yammer, LinkedIn, Dynamics, and other applications will feed sophisticated deep learning systems to give unique and powerful insights on individual and team productivity, on organizational efficiency and bottlenecks, on the quality of relationships with customers and partners, and on best practices across the organization. No other enterprise IT vendor would be able to match it. Not only would this cement the role of Office 365 in enterprises, but it would also make Microsoft’s other enterprise applications, tied to Office and able to apply deep learning to their usage data, much more attractive. Moreover, Microsoft may well introduce new software categories building on the insights of organization-wide deep learning business analytics, with no chance of meaningful rivalry. Right now, enterprise application software – implementation, licenses and maintenance, and not including the internal costs of supporting it for enterprises – is a $170B industry (Exhibit 6-7). Microsoft has just 14% of that spending. We believe that an AI-charged cloud strategy could allow it to nearly double its share over the next decade, capturing some of the spending on customized development and internal support in the process. The top public cloud hosts – specifically Amazon Web Services, Microsoft Azure and Google Cloud Platform – all operate with a similar architecture. Massive individual “hyperscale” data centers networked together and able to act as an integrated computing and storage resource. On a software level, innovations pioneered by Google and contributed to the open source community break problems into pieces that can be addressed in parallel and then recombined, enabling almost limitless scale. Other innovations allow mountains of data to be parsed and analyzed efficiently without requiring that the data conform to rigid formats. The hardware infrastructure is based on proprietary server boards built from commoditized parts, cheap and replaceable should they fail, in facilities designed to the teeth to root out costs. The whole platform runs at base costs and capacity utilization levels that are unachievable for smaller players, while offering the benefits of flexible capacity on demand, global availability, and world-class bundled security and support. (http://www.ssrllc.com/publication/37440/) All in, we believe that the hyperscale leaders have as much as a 10 to 1 cost advantage over typical enterprise operations, and perhaps 20-30% advantage over would-be public cloud competitors with less scale (Exhibit 8). Thus, the exodus to the public cloud has begun and that only Amazon, Microsoft and Google have the sophistication and scale needed to be long term winners. 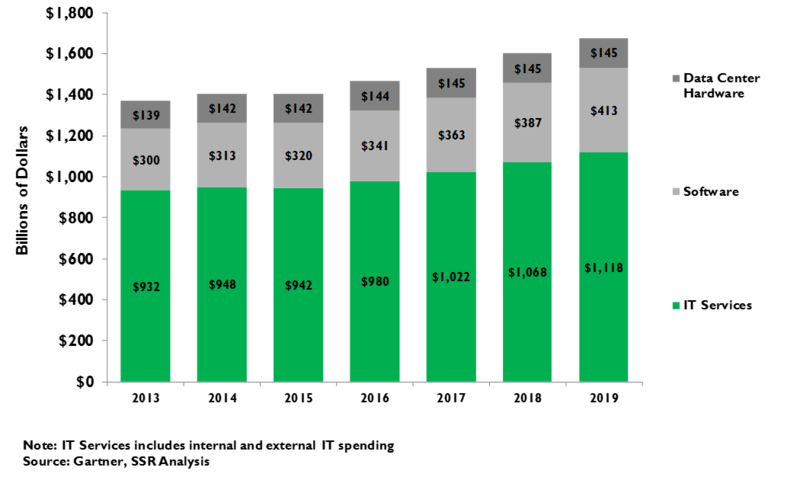 The opportunity is huge – nearly $1.4T is spent annually on private enterprise data centers, and even though the shift to the cloud will be very deflationary, we expect hundreds of billions of dollars in annual spending within a decade (Exhibit 9). As the migration extends beyond the web-based businesses that have been the early adopters of the public cloud to the more traditional enterprises that will surely follow, Microsoft has considerable advantages. The salesforce, positioned universally across the IT community, is a huge asset, as is the extensive installed base of Windows Server and SQL Server accounts. Microsoft can differentiate its platform on the basis of higher level tools, such as database software, analytics, deep learning systems, or solutions for managing data and computing spread between in-house data centers, Azure and other cloud operations. Microsoft’s comments on Azure suggest that it is on a roughly $3-3.5B annual run rate, growing at a better than 100% pace, still only a third the size of AWS but growing almost twice as fast (Exhibit 10). With this, it is already more than offsetting any deterioration in the Windows Server and SQL Server packaged software franchises, and poised to drive significant acceleration for the Intelligent Cloud segment in coming quarters. Given the opportunity and its trajectory, we believe that Azure can hit a $20B run rate within 5 years. For investors the “More Personal Computing” reporting unit is puzzling. In it are bundled a hodge-podge of businesses, most of which are viewed as either dead ends or distractions (Exhibit 11). Windows licensing is in here, big and profitable but declining with the erosion of the PC market. Windows 10 was given away to existing customers as a freebie, so no more quadrennial upgrade cycle. Microsoft’s various consumer franchises are in here – Bing, Skype, Xbox Live, etc. – none of them an investor favorite. The hardware businesses are here too – the shrunken remains of Nokia, the Xbox console biz and the surprisingly frisky Surface tablet. In the bunch, there is nothing growing that is big enough to make a difference. What then to make of this? The strategic intention of “More Personal Computing” is not really growing these specific businesses or hatching similar new products that might fit into the category. Rather, we believe that the main goal is to foment a paradigm shift in the way that individuals access and work with the applications, data and computing platforms being nurtured in the other two Microsoft reporting units. The AI-powered voice assistant Cortana, integrated as a feature of Windows 10, is a harbinger of this future (http://www.ssrllc.com/publication/ai-assistants-the-next-user-interface-paradigm/). The model of a start menu with a list of options for individual programs gives way to a generalized interface that takes commands – typed, spoken, gestured, or even inferred – and finds information, completes tasks or connects the user to resources that they require. The interface follows from Microsoft’s platforms into its applications and then follows those applications onto whatever device and platform the user chooses, maintaining a consistent understanding of the user’s needs. Whether one is on the computer at home or the computer at work, on a smartphone, a tablet, an Xbox console, or, someday, a HoloLens Augmented Reality headset, Cortana will follow, bringing with it all the knowledge and access necessary to make your time as productive as possible. In this way, the interface cements the user’s relationship with Microsoft, accustoming them to its platforms, encouraging the use of its applications and services, and helping to tie it all together into a coherent experience. This will not be monetized directly – Microsoft will integrate its interface technology to its applications and will charge for its platform only when it is sold on a brand new device. Upgrades will be regular and free, to hasten adoption encourage the use of Microsoft services. Most of the benefit will come from increased utility and stickiness for the growing suite of applications, but there will be consumer advertising and subscription services opportunities as well. After parsing out the three strategic planks, the mission statement – “To empower every person and every organization on the planet to achieve more” – feels far more concrete. The future Microsoft will be focused on delivering productivity through applications that use deep learning to help organizations and people work as easily, efficiently, and effectively as possible, running on a best-in-class cloud platform that supports the specific needs of a disparate universe of enterprises, with an intelligent interface that personalizes user interactions across all paths of access. The short term strategy fully supports this long term narrative. A managed migration to Office 365 allows Microsoft to begin capturing data on behalf of customers (Note: this data would NOT be shared) forming the basis for future deep learning analysis. The LinkedIn acquisition makes perfect sense in this context, adding data on connections between individuals and across organizational lines. The data begins to drive improvements in other applications – for example, LinkedIn’s social selling initiative integrated into Dynamics CRM, or assessments of team effectiveness from Office 365 used to inform staffing decisions in an HR solution. Meanwhile, Office 365 is an anchor tenant for Azure, its growth helping the cloud platform to gain the scale needed to be cost competitive. 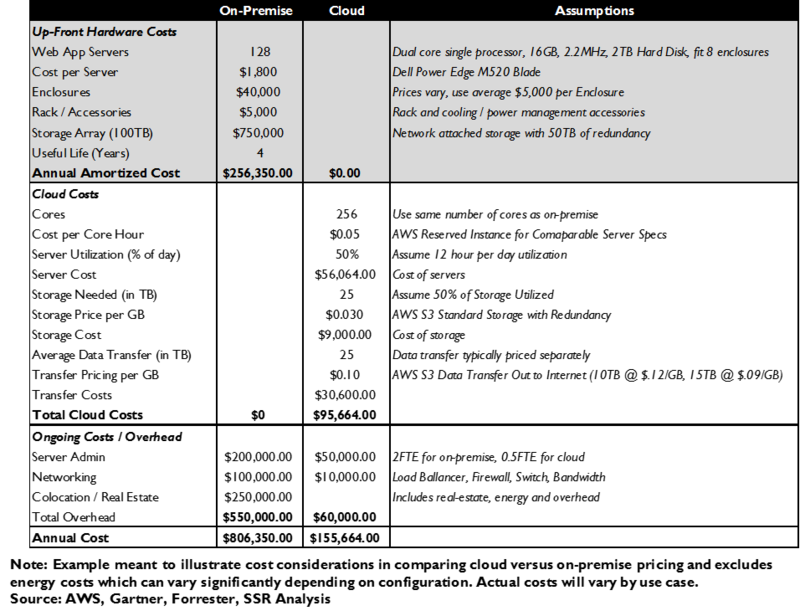 At the same time, the strength of Azure – cost, scalability, geographic availability, security, etc. – is a substantial asset when integrated into Microsoft’s SaaS applications. Rivals – Salesforce, Oracle, SAP, IBM and others – are bundling their own sub-scale, higher cost and less capable infrastructures, and will be at growing disadvantage long term. In the recently reported 4QFY16, Microsoft easily topped consensus expectations for declining sales. The Productivity and Business Processes segment had 8% YoY non-GAAP sales growth in constant currency, as the transition from Office to Office 365 is delivering double digit revenue growth for the franchise across commercial and consumer end markets. We believe that the subscription model raises the revenue potential for Office, removing the incentives for customers to defer upgrades. We also note that this shift releases Microsoft’s sales organization to refocus the time and effort spent selling upgrades, enabling new focus on other products and/or lower selling costs. 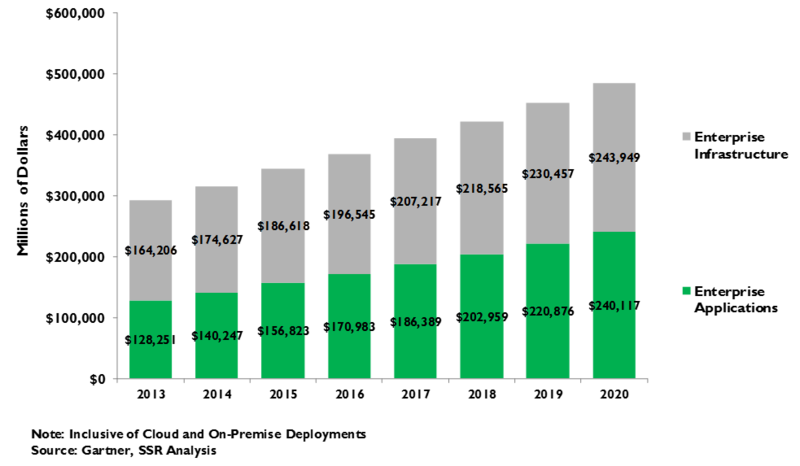 Over the next few years, we expect this segment to sustain sales growth in the high single digits with improving profitability. The Intelligent Cloud segment was the fastest growing unit, up 10% in constant currency, driven by a doubling of Azure revenues, which we believe have risen to about $800M in the quarter. Importantly, Microsoft’s Server business (mostly Windows Server and SQL Server), offered as both licensed software and as cloud services, grew 8% YoY. 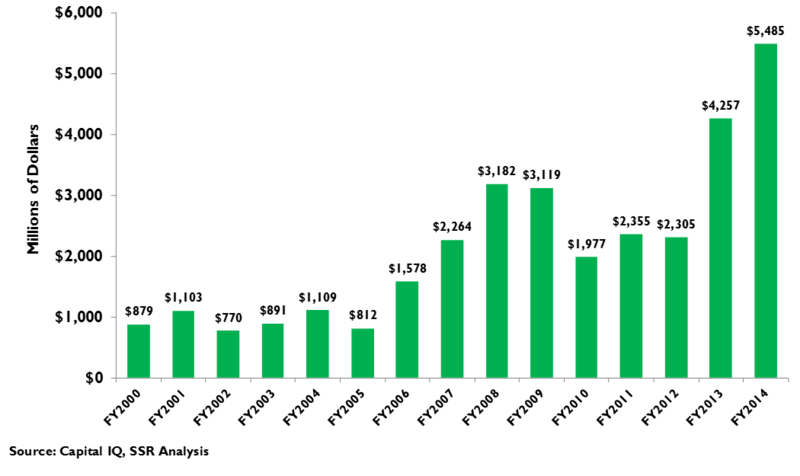 With Azure now about 12% of segment revenues and continuing on its triple digit growth trajectory, we see sales for the whole segment accelerating quickly with margins for the IaaS platform improving with scale. More Personal Computing has been the laggard, suffering from the painful dissolution of the former Nokia mobile phone business. Those harsh compares may be past, but this segment still bears the primary weight of the decline of consumer PC sales and the end of paid Windows upgrades. Cortana will be a conduit to other Microsoft products but won’t be a revenue generator on its own. We believe that growth from ad sales, LinkedIn premium subscriptions, Surface tablets, and Xbox can largely fill in for declining Windows revenues, but on an overall basis we see this business segment as flat going forward. Collecting our beliefs about Microsoft’s future prospects into a model, we believe the company can deliver accelerating top-line growth of nearly 7% through 2021, with slight leverage to the bottom line. 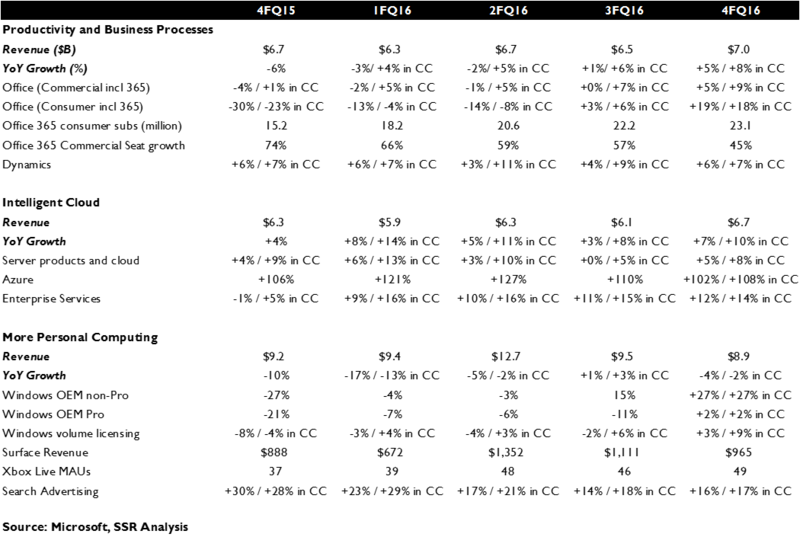 Assuming steady capex as a percentage of sales, cash flows would follow a similar trajectory to net earnings. These rough assumptions suggest significant upside on a DCF basis to the current $57 share price – our model yields a nearly $90 fair value with what we believe are reasonable assumptions. Given that we believe that consensus 2017 EPS assumptions are likely 10% too low and the potential for positive news flow as the narrative changes to match Nadella’s vision, we see ample catalysts to drive the stock up another leg from here during the next 12 months.